Pianist Amy I-Lin Cheng has won prizes in many competitions including the 2000 Heida Hermanns International Young Artist Piano Competition. As the winner of the Rising Young Artist Series in Taipei, Ms. Cheng gave her Taipei debut recital in August 1999 in the National Recital Hall and toured Taiwan. In the same year, Ms. Cheng was invited by the Formosa Chamber Music Society to perform a solo recital at Weill Recital Hall at Carnegie Hall. Reviewing that concert, the New York Concert Review stated, “her control of the keyboard is complete, technique easy and relaxed, with a wide range of touch, color and dynamics." Claude Frank described her as "a brilliant, sensitive, imaginative and most beguiling pianist." She gave her New York debut recital at Merkin Concert Hall in 1998 under the auspices of the Guild of Composers in New York City. Ms. Cheng also has performed in other concert venues such as the Isabella Stewart Gardner Museum, Jordan Hall, Tsai Performance Center and appeared on concert series throughout the United States. Cheng has performed as concerto soloist with the 'Musica Viva' Moscow Chamber Orchestra with conductor Alexander Rudin and with Oklahoma Community Orchestra with conductor Manuel Prestamo. As the winner of the concerto competition at the New England Conservatory, she made her Boston concerto solo debut at the age of 17 at Jordan Hall with conductor Benjamin Zander. An avid chamber musician, Ms. Cheng performed with the Van Dingstee String Quartet from the Netherlands and the American Chamber Players on tours during the 2005-2006 Season. She is the current co-Artistic Director of the Brightmusic Chamber Ensemble in Oklahoma City. Ms. Cheng has appeared at Merkin Concert Hall as a member of the Guild of Composers Chamber Ensemble and in concerts at Weill Recital Hall at Carnegie Hall. As a founding member of the former Goffriller Trio, she performed in The Third Jerusalem International Chamber Music Encounters in Israel directed by Issac Stern, and the 1999 La Jolla SummerFest. Ms. Cheng has appeared in 2004 Society of Composers, Inc. National Conference, and in music festivals such as Thy Chamber Music Festival in Denmark, Academie de Musique de Lausanne in Switzerland, the Third Gilmore International Keyboard Festival, OKMozart International Festival, Amadeus Piano Festival in Tulsa, International Clarinet Connection in Boston, Taos School of Music, and Norfolk Chamber Music Festival. As the pianist for Duo Clarion, she collaborates with husband/clarinetist Chad E. Burrow. The duo has given recitals across the US, and recently toured Asia. The duo made its debut CD recording appearance on "Chamber Music of Edward Knight" on Albany Record in 2005. The duo also forms Trio Solari with violinist Sean Yung-Hsiang Wang. Ms. Cheng's recent performances included chamber music concerts with the Brightmusic Chamber Ensemble, Beethoven Triple Concerto with the Oklahoma City Philharmonic, Chopin Concerto No. 2 with Oklahoma Community Orchestral, Mozart Piano Concerto No. 22 with the Taichung Philharmonic in Taiwan, Rachmaninoff 2nd Piano Concerto with Orchestra of the Pines in Texas, Liszt 2nd Piano Concerto with Oklahoma Youth Symphony and solo recitals in Oklahoma, Utah, Iowa and Taiwan. An active educator, she has been frequently invited to give masterlcasses at universities in the US and in Taiwan. She has been adjudicators for competitions in Taichung (Taiwan), Texas, Tennessee and Oklahoma. Many of her students have claimed success in regional and national competitions, summer festivals and graduate school auditions. Graduate of The Curtis Institute of Music (BM), Yale University School of Music (MM and Artist Diploma), Ms. Cheng Studied with Claude Frank. She is currently a Doctor of Musical Arts candidate at the New England Conservatory in Boston, where she studied with Ms. Wha-Kyung Byun. She has performed in master classes for Emmanuel Ax, Boris Berman, Leon Fleisher, Murray Perahia, Gary Graffman and Mischa Dichter. She has studied chamber music with Robert McDonald, Michael Friedmann, John O'Conor, Peter Frankl, Issac Stern, Emerson String Quartet, American String Quartet and Orion String Quartet. 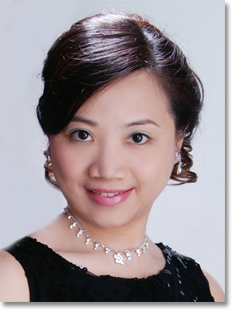 Ms. Cheng was Assistant Professor of Piano at Oklahoma State University in Stillwater, Oklahoma from 2002-2006. She also served as the Head of Piano Area and Assistant Professor of Piano at Oklahoma City University from 2006-2009. Most recently she was on faculty at the InterHarmony International Music Festival at Birklehof in Hinterzarten/Swarzwald, Germany. Upcoming performances for this season include concerts in Oklahoma, New York City, New Haven, Texas, Taiwan and Brazil.